Photo by Thadeus Greenson. 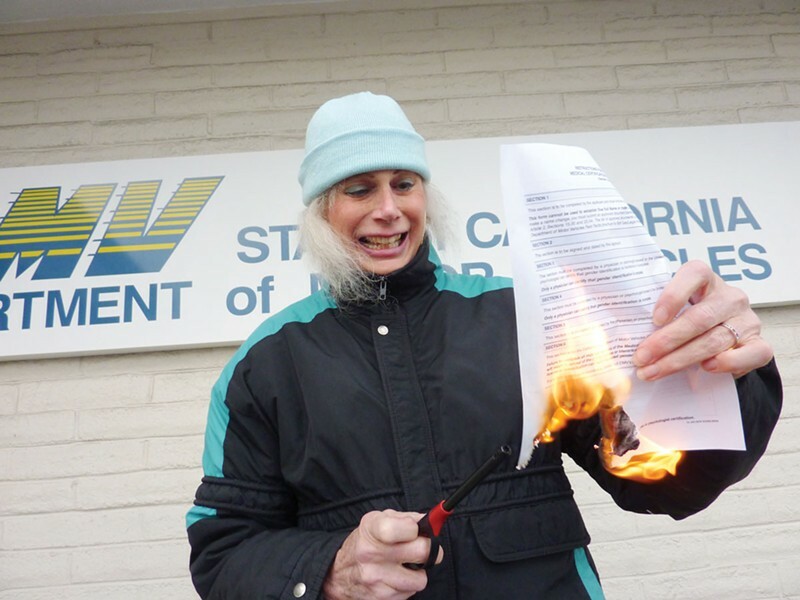 Joni Kay Rose, 69, burns a form in protest of what she sees as a policy of discrimination in front of the California Department of Motor Vehicles' Eureka office on Feb. 16. It's shortly after 8:30 a.m. on Feb. 16, and Joni Kay Rose is standing in front of the Eureka Department of Motor Vehicles office with sprigs of her gray hair bursting from a light blue knit cap. In one hand, Rose clutches DMV form DL 329, as her other hand fumbles with a lighter, trying to get it to ignite in a gentle breeze. After a few moments, a flame appears and Rose touches it to the form. She smiles as the flame grows, engulfing the single sheet of paper, reducing it to ash. It was a solitary act of protest for Rose, 69, who relocated to California from New Mexico in December with hopes of finishing her life here. Instead, thanks to the form and all Rose thinks it represents, she's now looking to move again. "I came here with the understanding that I would be safe in California, that I would not be discriminated against, that I would be treated just like any other senior lady my age," she said. For Rose, the trouble is the DMV does not view her like any other senior lady her age. Per departmental policy, it views her as a woman with a birth certificate that says she's a man, as someone whose gender must be certified by a physician or psychologist before the department can issue her a driver's license or identification card. "Unfortunately, this is our policy," explained DMV spokeswoman Jessica Gonzalez. "We're not trying to discriminate against her or anyone else, but in the business we're in, we have to prove who people are." Rose is and has been many things in her life. She's published two books — The Joy Beyond Craving: A Buddhist Perspective on Addiction and Recovery in 2003, and Over the Gender Rainbow: My Long Odyssey Back to Womanhood in 2011. She holds a cultural anthropology degree from the University of Michigan, and a Master of Divinity degree from the Starr King School for the Ministry. She also has experience as a teacher and a hypnotherapist. Rose said she began her gender transition in the late 1990s and it became official in 2006, when she had an irreversible surgical procedure. That same year, Rose secured a court order from New Mexico's Second Judicial District making her gender and name changes official. A few years later, the United States Social Security Administration signed off on the changes, and Rose received a new MediCare card with her new name that identified her as female. 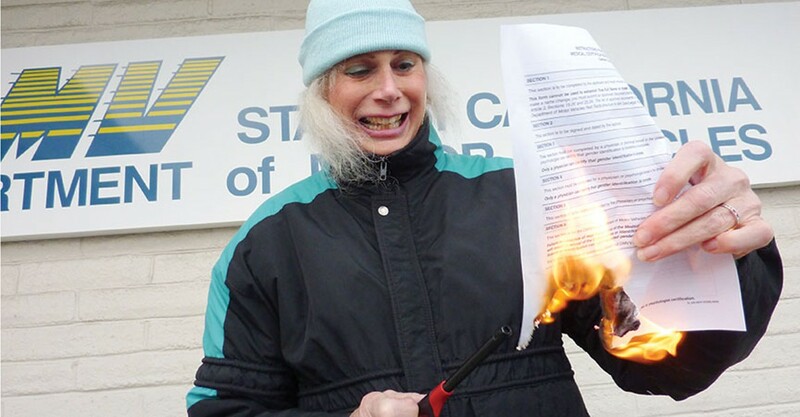 Rose said she's provided all this documentation — the court order, a statement from her surgeon, her old New Mexico driver's license and her MediCare card — to the folks at the Eureka DMV, who she said seemed happy to accept her changed name but said they wouldn't list her as female without a completed form DL 329. Rose appealed to the local offices of state Sen. Noreen Evans and Assemblyman Wesley Chesbro, both of which tried to help but could do little in the face of DMV policy. The whole situation, Rose said, is demeaning and offensive. "I've been living and working, using public restrooms as a woman for years," she said, "yet the DMV demands that I give a doctor the power to determine my gender?" Rose is just one of about 700,000 transgender individuals living in the United States, according to a recent study by the University of California at Los Angeles' Williams Institute. Sasha Buchert, a staff attorney at the Transgender Law Center in San Francisco, said society has taken steps to accommodate these individuals and protect their rights, but there remains a "patchwork" of identity requirement documents across the country. The irony of the situation, Buchert said, is that when the DL 329 form was implemented in 2008, it was likely aimed at helping transgender folks. "A lot of times, when requirements like this were originally made, they were considered progressive steps forward at the time," she said. But, Buchert said, she understands the frustration, and has heard from folks who feel it's utterly demeaning to have to go to a doctor or a psychologist with a form DL 329, which includes the line, "My professional opinion is that the applicants demeanor is:" with boxes indicating male or female. "We do definitely hear the frustration from clients," Buchert said. "Like anybody, they're born with their gender identity. It's not something they chose, but they're forced to go through gatekeepers just to amend their identity documents." Speaking by phone from the DMV office in Sacramento, Gonzalez said she understands the frustration, but said name and gender changes can pose a host of complications for her agency, which works to protect against fraud and identity theft when issuing state identification cards. The gender information on driver's licenses is also used to collect demographic statistics, as well as to help law enforcement identify suspects. Back at the Transgender Law Center, Buchert said it's important for folks to realize society has come a long way in working to protect transgender rights, and strides are being made all the time. She pointed to a recent provision that allows folks to change their gender administratively through the state Office of Vital Statistics, allowing folks living out of state to do so without making a special trip to California. When getting a court order to change their name, Buchert said, transgender folks will, beginning July 1, also no longer have to fulfill the requirement of publishing the change for four weeks in a local newspaper. The change, Buchert said, was made to protect transgender individuals. "There's been a lot of really great progress with regard to identity document processes in California specifically," Buchert said. "We are working for a world where people can live authentically based on their gender identity." Meanwhile, back in front of Eureka's DMV office, Rose said there's obviously a lot more work to be done. She pointed to the fact that California recently passed a groundbreaking law requiring K-12 schools to allow students to use the bathrooms and participate in the gender-specific activities of their choice. "Yet, adults wishing to drive motor vehicles must still defer to the medical profession to tell us who we are," she said. "I don't think having this form that singles out a particular group of people is in keeping with equal rights. If they continue doing this, I don't think this is a state I want to live in."